A Transformer transfers electrical energy from one electric circuit to another by use of electromagnetic mutual induction. Its main purpose is to convert power at one voltage level to AC power of the same frequency to another level. Without transformers, the widespread distribution of electric power would be impractical. A transformer is a static device (no moving parts) used to transfer energy from one AC circuit to another. This transfer of energy may involve an increase or decrease in voltage, but the frequency will be the same in both circuits. 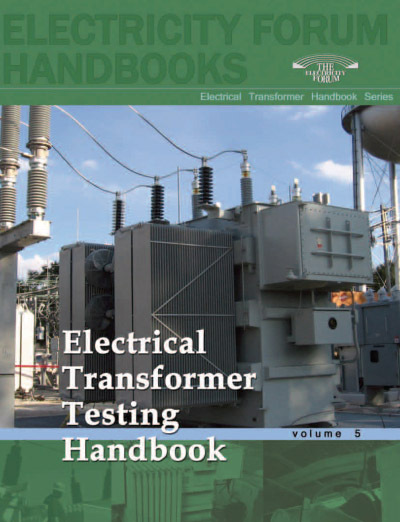 When the transformation takes place with an increase in voltage, it is called a step-up transformer. When voltage is decreased, it is called a step-down transformer. They accomplish this change in AC voltage with very little loss of power. Transformers make it possible to generate power at a convenient voltage, step it up to a very high voltage for long-distance transmission, and then step it down for practical distribution. A basic transformer (Figure 1) consists of two coils wound around an iron core and linked together by magnetic flux. The varying current of AC power is required to produce a varying magnetic flux in the iron core so that electrical energy from one winding is induced into the other. The winding that receives the power from the supply is called the primary winding, whereas the winding that delivers power to the load is called the secondary winding. When an AC voltage is applied to the primary coil the resultant current flow sets up a magnetic field that is constantly changing. As this field expands and collapses, it causes an AC voltage to be induced in the secondary winding. The AC frequency of the primary induces the same frequency in the secondary. The principle of operation of a transformer is based on mutual induction. Mutual induction occurs when the magnetic field surrounding one conductor cuts across another conductor, inducing a voltage in it. This effect may be increased by forming the conductors into coils and winding them on a common magnetic core. When the primary coil of a transformer is connected to an alternating voltage, there will be a current in the primary coil called the exciting current. This exciting current sets up an alternating flux that links the turns and induces a voltage in both windings. The voltage of self-induction induced in the primary is a counter-voltage, opposite in polarity and almost equal in magnitude to the applied voltage. This limits the exciting current to a relatively low value. Primary exciting current lags the applied voltage by approximately 90 degrees because the coil is mainly inductive and has very little resistance. The voltage induced in the secondary winding is a result of mutual inductance. Since a typical power transformer has a flux linkage of almost 100%, the same voltage will be induced in each turn of the secondary coil. The total induced voltage, therefore, will be directly proportional to the turns on the primary and secondary coils. Transformers are wound on cores made from stacks, or laminations, of sheet steel. The core ensures a good magnetic linkage between the primary and secondary windings. Eddy currents are caused by the alternating current that induces a voltage in the core of the transformer itself. Because the iron core is a conductor, it produces a current by the induced voltage. By laminating the core, the paths of the eddy currents are reduced considerably, thereby reducing heat and power loss. Eddy currents are prevented from flowing from lamination to lamination by a thin coating of insulating material on the flat surfaces of the lamination. The eddy currents that do exist are very small and represent wasted power dissipated as heat in the core.